Cast-aluminium designs allow for bigger waterways, making them more tolerant to variable system quality. Against the background of much debate about the relative merits of aluminium and stainless steel for heat exchangers in boilers, Dr Elaine Lancaster of Ideal Commercial Boilers, makes the case for aluminium– a material that is increasingly being specified over stainless-steel alternatives. Building-services engineers are falling under increasing pressure to increase the life expectancy of the boilers they install, whilst simultaneously facilitating a quicker heat transfer for optimum efficiency. To respond to this demand, many are beginning to explore different solutions available on the market. The key to increased efficiency and longevity of a boiler’s performance is the material used to manufacture the heat exchanger. In our experience, aluminium is increasingly being specified over stainless-steel alternatives for heat exchangers. Cast iron and copper were the materials typically used to manufacture the heat exchanger before the industry began to recognise the benefits of more efficient combustion systems utilising stainless steel and aluminium alloys, particularly for high-efficiency condensing boilers. When designing a condensing gas boiler, it is important to select the material that offers the greatest number of advantages for the manufacture of the heat exchanger, which is why Ideal Commercial has increasingly focused its expertise on aluminium heat exchangers over other alternatives. Not only does aluminium enable the design of lighter compact boilers to make them easier to install, but it also aids robust design to optimise boiler efficiency. When comparing aluminium to stainless steel, thermal conductivity for stainless steel is 14.9 W/m K, the thermal conductivity of aluminium is 237 W/m K. As a more effective conductor of heat, aluminium can significantly reduce the exchange surfaces to achieve the same output to the heating circuit, becoming more compact when used at an equivalent output. 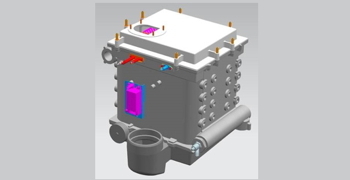 This means boilers incorporating an aluminium heat exchanger assists in the design of high-efficiency boilers in a small space envelope. The design options given by aluminium heat exchangers can deliver a lower hydraulic resistance when compared to some stainless-steel designs. This is because cast-aluminium designs allow for bigger waterways, making them more tolerant to variable system quality, and less prone to damage caused by the build-up of air and dirt. When assessing the performance benefits of Ideal Commercial’s Evomax range, which utilises aluminium heat exchangers, the waterway area is at least double the size of some competitor stainless-steel heat exchangers. Stainless-steel heat exchangers also depend on water velocity to clear any debris, but because they have very narrow waterways, the system often does not flush as effectively as aluminium systems. This also means that the heat output of the boiler is reduced, having a negative effect on the overall efficiency level of the system. With installers and building-services engineers under increasing pressure to prolong the typical lifespan of boilers, it is important to ensure that any boiler system design uses components which are as resistant to corrosion as possible. The material properties of aluminium enable the material to naturally generate a protective oxide coating to create a more corrosion-resistant heat-exchanger solution. When water or oxygen makes contact with aluminium, the material forms a non-porous protective layer of aluminium oxide, also known as alumina and often termed passivation layer. As a lightweight material, aluminium is well suited for heat exchangers in wall-hung boilers. 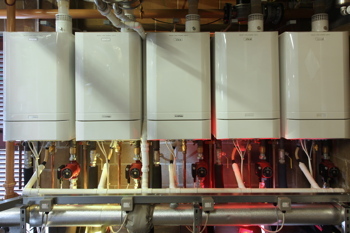 Whilst previously boilers were always designed to prevent the internal condensation of hot gases, modern boilers are designed to work in the opposite way, producing acidic condensate during operation. This enables the recovery of latent heat, so boilers are more efficient than those which would have been installed 30 years ago. The acidic condensate that drips from the flue ways during low-temperature operation is led away to the drain. The aluminium heat exchangers designed by Ideal Commercial transport any condensate produced during operation over the surfaces of the heat exchanger, continually draining it away. This means that the condensate inside the system is never stagnant. As condensation build-up increases the risk of corrosion, a correctly designed heat exchanger can reduce the risk, in some cases by as much as 100%. This design of heat exchanger can therefore give superior durability over other types of heat exchanger. In addition to passing on a lower cost of ownership for building owners, aluminium heat exchangers also offer advantages in a maintenance or servicing scenario. The fact that this material aids heat-exchanger designs that are tolerant to variable system quality means it is well suited to replacing boilers in older heating systems. Ideal Commercial aluminium heat exchangers can facilitate a wider range of temperature differentials, typically 11 to 25 K, and flow rates. In older systems, a 20 K differential can be difficult to achieve without making several system modifications. In addition to improving boiler efficiency, delivering a more sustainable option and enabling increased boiler lifespans, aluminium heat exchangers also pass on several practical benefits to installers and building service engineers. As a lightweight solution, aluminium heat exchangers represent the lightest of the most commonly used metals, being over 60% lighter than the same volume of stainless steel. This makes it a convenient solution for installers and engineers to use for compact, wall-hung boilers. Modern casting technologies use the latest in lightweight, tough and durable aluminium alloys, offering many benefits (including for Evomax a monobloc casting without welded joints), and a positive weight-to-heat output ratio. As heat-exchanger technology continues to develop and the demand for smaller and less obtrusive boilers increases, installers and engineers are continuing to favour aluminium heat exchangers for the efficiency benefits they provide. By selecting aluminium as the preferred heat exchanger today, Evomax boilers overcome the challenges associated with compact boiler designs, resilience to variable system design and the growing risk and consequences of corrosion. Dr Elaine Lancaster is research-and-development director at Ideal Commercial Boilers.